Liquid calories can add up fast! Here are some tasty and festive holiday solutions for Thanksgiving and Friendsgiving celebrations. Mini-Mosas. Mix a little soda water with orange juice for kid-friendly bubbly mimosas. 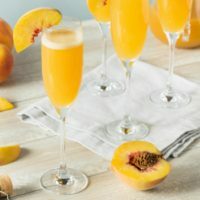 Petite Peach Bellini. Puree frozen peaches with a bit of water until it is the consistency of sorbet. Mix with sparkling water for a new take on this classic brunch cocktail. Minty Milk. Add a few drops of peppermint extract to your choice of milk for a super easy, festive beverage. Warm it up on the stovetop for an extra cozy feel. Warm & Fragrant Cider. Make your own hot cider in the crockpot. Simply throw in apple cider, whole cinnamon sticks, and cloves. As a bonus, your house will smell amazing. Piping Hot Cocoa. Try using melted dark chocolate for an authentic taste, or use cocoa powder instead of a hot chocolate mix. Add mini marshmallows and a drop of peppermint extract. Fresh Squeezed OJ for a Holiday Brunch. There is nothing better than a glass of orange juice from freshly squeezed fruit. Have the kids help squeeze all the oranges into a bowl. For reference, 2-4 medium size oranges will yield 1 cup of juice. Cut half of the juice with water for a lower sugar alternative. Get more refreshing and healthy ways to hydrate.